Steffie Hands at 562-508-9869 or email. This beautiful Craftsman Bungalow built in 1923 has a barrel roof and a large wrap around brick porch. The original owner worked for a brick manufacturing company, and used unique beige bricks on this wrap around porch. This property is located in the Bluff Park Historic District, and is 3 short blocks to the beach. The house is 1,974 square feet, and the lot is 6,761 square feet. The home features 4 bedrooms, with one being used as an office with built in bookcases. There are 1 and 3/4 baths. The living room has many of the original features, with most of the woodwork meticulously restored. There are original oak hardwood floors in 5 rooms. There are built-in bookcases, a gas fireplace, gumwood paneling and solid gumwood doors. The large original molding in living room and dining room frames the rooms nicely. The dining room includes beautiful large windows, wainscoting, molding with picture ledges, and a door to the wrap around porch. The remodeled kitchen features a modern Craftsman aesthetic with beautiful wood cabinets, and granite counter tops, stainless steel appliances, and tumbled travertine floors. There is an original skylight, and large pantry for storage. The kitchen door leads to another patio by the garage. The master suite has a large walk in closet, gas fireplace, and French doors that lead to the backyard. The master suite could easily be used as a den. The master bath was completely remodeled in 2017 with a large walk-in shower, new cabinetry, fixtures and flooring. The first full bath has the original bungalow cabinetry and a soaking tub with a shower. The office room was remodeled in 2016, with the addition of a new laundry area with a stackable washer and dryer. Additional cabinetry was added for storage and workspace. The one car garage has been extended towards the back and built higher with lots of windows, enlarging it in a loft like style that could be useful as a studio or workshop. There is a concealed half bath, and tons of storage are in the garage. The driveway is gated for privacy, and can hold 3-4 cars. The backyard has a Pacific Northwest feel to it, with large mature trees and shrubs, and a soothing fountain. It has a large, covered stone patio, perfect for entertaining during the day or evening. There is a raised bed for herbs, vegetables, etc made out of old bricks from the property. There is outdoor and landscaping lighting. Both the back and front yards have been landscaped with irrigation. The property also features a retrofitted foundation, upgraded electrical, central heat and air conditioning, and recessed rain gutters. Both fireplaces have been extensively renovated. All appliances included: washer, dryer, stove, fridge and dishwasher. 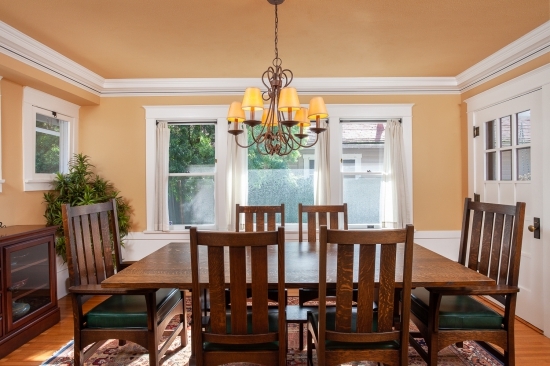 There are original double-hung windows throughout, and the original skylights are in kitchen and hallway. There is a large attic for even more storage. ADT security system. Please contact Steffie Hands for more information. The accuracy of all information regardless of source, including but not limited to square footages and lot size, is deemed reliable but is not guaranteed and should be independently verified through personal inspection by and/or with the appropriate professionals. Listing data is obtained from the Internet Data Exchange (IDX) of the SoCalMLS®, unless otherwise specified.